Bear with me for a moment. Every time I’ve ever watched Return of the Jedi, dating back to when I first saw it in 1983, one specific moment has always stood out. It isn’t one that you would necessarily expect—it doesn’t involve any of the main characters in any great capacity, and it doesn’t really impact the film or story in any major way. When Luke fights the Rancor at Jabba’s palace, he’s forced to vanquish the massive beast, crushing its skull with a giant metal sliding door. Of course he had to defeat the monster, it would have been one crappy movie if the hero died a few minutes in. But when they show the Rancor Keeper, Malakili, he’s obviously devastated. That gets me every single time. He didn’t view the Rancor a bloodthirsty monster hungry for Jedi-flesh. This was a pet, a part of his life, a member of his family, a loyal companion. Losing a pet, something you care that much about, is a crushing blow, and in this case, you can see the emotional pain it causes someone. This new comic strip, written and drawn by Chris Gugliotta, tells the story from the side of the Rancor and Malakili. 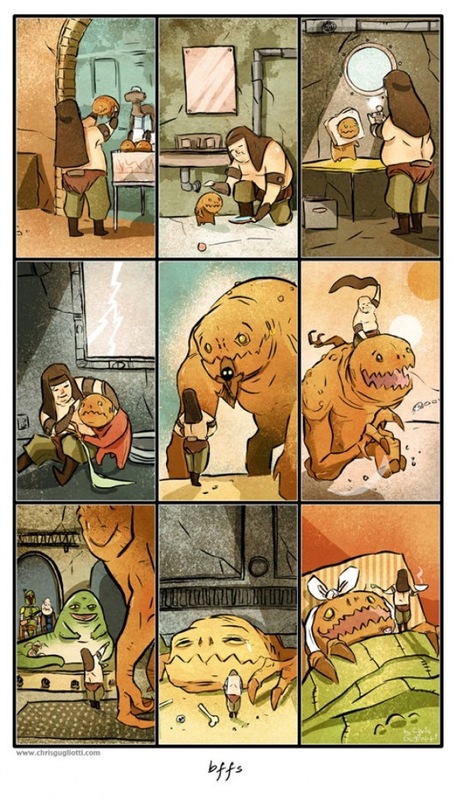 You get the whole picture, from picking out the perfect little Rancor pup (or whatever you call a baby Rancor) from the litter, raising it to be big and strong and obedient, doing stupid things like putting its head through a piece of bread, you know, the usual stuff. They look so happy together, lifelong friends. This version of the story, however, has a happy ending. 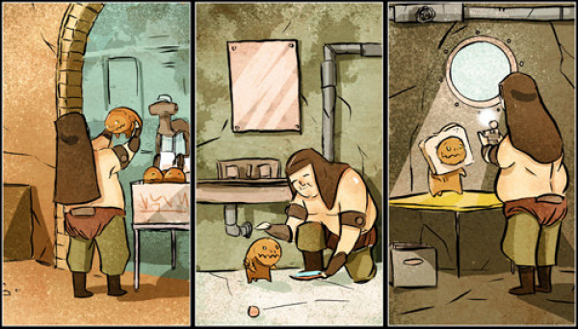 The Rancor wasn’t dead, just stunned, probably has a concussion, and Malakili is able to nurse him back to health. I like this version, and from now on I’m going to imagine this is how it went down. Check it out for yourself. This is similar to a story from “Tales from Jabba’s Palace” – semi-canon stories, but fun nonetheless. Lovable. I think I like this ending the best. I’m so glad he got a happy ending! Thank you for this!